It looks like Amazon has made another acquisition under the radar, this time to boost online sales in fashion. The company has purchased Shoefitr, a startup based in Pittsburgh that has developed 3D technology to help match online shoppers with shoes that will fit them better. We were passed the news of the sale by a reliable source very close to the company, and we have reached out to both Amazon and Shoefitr for direct confirmation of the deal, as well as a price. (But it looks like we are not the only ones who have heard about this.) From what we understand, Shoefitr will eventually be relocating to Amazon’s Seattle HQ. But there are other question marks over how Amazon plans to utilise its new acquisition. Will it implement the Shoefitr tech itself directly on its own site, will it integrate it into Zappos subsidiary, or both? Also unclear is whether Shoefitr will continue to work with its existing customers, which included the likes of Nordstrom, Cole Haan, REI and others. If another recent acquisition, of Internet of things specialist 2lemetry, is anything to go by, Shoefitr could continue to work with existing customers, although recently it looks like Nordstrom stopped using Shoefitr’s tech. And when you think about it, a lot of Shoefitr’s retailer customers are essentially Amazon competitors. There are several reasons why Shoefitr is a smart acquisition for Amazon. The first is the most basic of all: buying shoes online is still not a great experience. Not only are there problems with really being able to see what you are buying, but you are unable to try shoes on. Despite the growth of commerce online, there are still gating factors for many consumers. Companies like Zappos have worked around these problems up to now by offering customers the ability to send back, without charge, anything that they do not want to keep, but this leads to potentially high operating costs. Apparently at one point the company’s average return rate was 35%, going up to 50% for its most loyal customers. It’s a problem I know Zappos specifically has been trying to tackle from many angles, looking for ways for customers to provide more accurate measurements of their feet, for example, in order to match them with a more targeted selection of footwear. Shoefitr’s technology works in a couple of different ways. 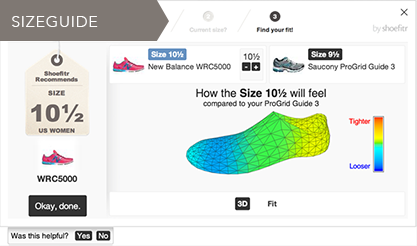 First of all, customers enter their own shoe size and your current shoe model, and then Shoefitr matches up this data with shoes in its database to recommend which size and shoe models would give you a similar fit. As anyone who has bought shoes knows, your actual size can vary a lot depending on the brand and shoe type, and even country where the shoe is made. Shoefitr estimates that a specific size can be “wrong” 45% of the time. Second of all, it takes into account lots of different variables such as shape, sole thickness, weight and so on, giving you comparisons against your current pair. Founded in 2010 by Matt Wilkinson, Nick End, and Breck Fresen — all college athletes — Shoefitr uses 3D technology that it developed in house to scan shoes both inside and out to have the most accurate information. It then has keeps a big database for each customer where it is able to match up a customer’s own specific stock against the wider world of shoes for compatibility. All of this helps online shoppers connect with more accurate shoe recommendations. Crystal ball time! While the tech could help Amazon with sales of shoes, what’s also interesting to consider is whether the company has plans to try to apply the technology to other items, such as clothes, which have their own right-fit issues when purchased online. Shoefitr raised $1.3 million in funding from Vital Venture Capital, Innovation Works and the AlphaLab incubator.